I have been eagerly waiting for this issue to come out because I have a small piece in here on mirror-reading. I owe a huge, huge debt to one of my Doktorvatern, John M.G. Barclay, for his care in historical method and this article (as noted in the first footnote) is dedicated to him. Also, I am deeply grateful for Simon Gathercole’s editorial comments and recommendations. He also happened to be my external examiner for my thesis back in 2009. Simon holds JSNT authors to the very highest standard for quality writing and he came back to me several times after reading my paper over and over – he always had new comments! I really admire how seriously he takes his role. So thank you, thank you, thank you! Anyway, the names of the articles are below. He orders wives to be subject to husbands. Gordon Fee, pushing back against views that try to universalize the Household Codes for all families of all times, makes some fascinating points about how Paul refers to house churches and what implications that might have for how we understand the Household Codes. Is it possible, Fee wonders, that the Household Codes (Ephesians/Colossians) are written to house churches of elite families that may have required (or expected) more strict regulations regarding authority? It could be that the house churches of Colossae were Roman villas of the wealthy. Would Paul’s advice be different if the house church met in an insula? …it is of interest to note the differences between how Paul speaks of Philemon’s household and the church that met there and how he speaks of that of Priscilla and Aquila in Romans 16:3-5. In the former case Paul greets both Philemon and his wife Apphia; but when greeting the church he uses the singular pronoun (“and the church that meets in your home”). Priscilla and Aquila, on the other hand, were artisans (tentmakers), who would not have lived in a villa but (most likely) an insula, where the house church would have met in a large room upstairs. In their case, and in contrast to Philemon, not only is Priscilla mentioned first, but Paul sends greetings to the church that meets “at their house” (cf. 1 Cor 16:19). (p. 375). Fee accepts that Col 3:18-4:1 is patriarchal, but these texts “do not bless that worldview theologically” (375). Paul gives advice as to how to live Christian lives in that cultural setting. 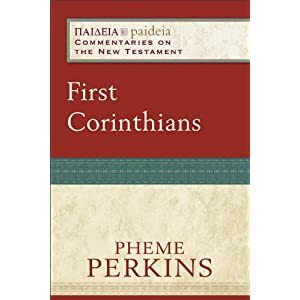 Christian theology that requires adherence from all believers in all times and places need to be made of sterner stuff–derived from clear, explicit texts whose intent is specifically to instruct regarding what Christians are to believe (375). Thank you Dr. Fee! Well said!